Mina Tagawa has a best friend that she shares secrets with. She has a big brother with a room full of track trophies. She has a grandfather who raises roses. But suddenly, in December 1941, she has a new identity: enemy. Dust of Eden is a powerful story, told simply in verse. The beautiful writing and simple lines belie the tragedy of the subject: for three years Mina and her family live behind barbed wire for no other reason than that they are of Japanese-American ancestry. At first it is a matter of putting up with classmates and others throwing that hated word, “Jap,” in her face. But once they are removed to an internment camp, there are more ordinary challenges in an extraordinary circumstance: how to take a shower. How to keep a dirt floor clean. But most of all, how to keep her father and brother from fighting. 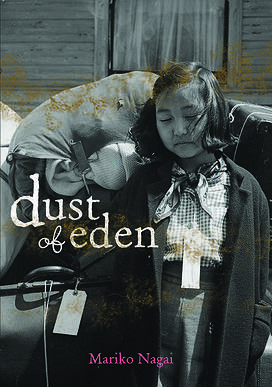 Dust of Eden tells the story of one of America’s great shames. But it also tells the story of the ties that bind a family and friends,who remain true even when a prejudice tide sweeps away so many. Four-year-old Marilyn, sitting next to her mother in church, wonders why Lot had to flee from the bad city. Written in unrhymed sonnets, How I discovered Poetry, is both a heartwarming and disturbing memoir. It is Marilyn Nelson’s story of growing up in the 1950’s, an African-American girl, daughter of one of the first African-American career officers in the Air Force. It is the story of a military family, moving many times, following her father’s transfers all over the States and constantly saying goodbye to friends. But most of all, it is a poignant memoir of a young girl, coming to maturity and recording, in beautiful verse, her own history, so similar, but different, to the history of so many others.